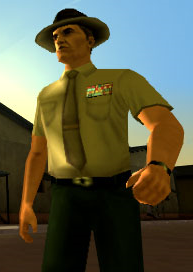 Sergeant Peppah, as depicted in Grand Theft Auto: Vice City Stories. Sergeant Peppah is a character from the Grand Theft Auto series who appears as a minor character in Grand Theft Auto: Vice City Stories. Sergeant Peppah is a sergeant who is based at the Fort Baxter Air Base, and along with Sergeant Jerry Martinez, is Victor Vance's commanding officer. Sergeant Peppah kicks Victor out of the army during the mission Conduct Unbecoming. Sergeant Peppah can also be seen in the multi-player mode of the PlayStation Portable version. The name Sergeant Peppah is probably based on the "Sergeant Pepper" character from the well-known Beatles album "Sergeant Pepper's Lonely Hearts Club Band". This page was last modified on 2 September 2011, at 01:59.